Prince Jonah Kūhiō Kalanianaʻole (3/26/1871 to 1/7/1922) was born in Kaua’i, made a prince at age 13, educated in Hawaii, California, England, and Japan, and known for his work during the overthrow of the Hawaiian monarchy in 1893. A holiday in his honor is celebrated each year on his birthday. It is one of only two US holidays dedicated to royalty. 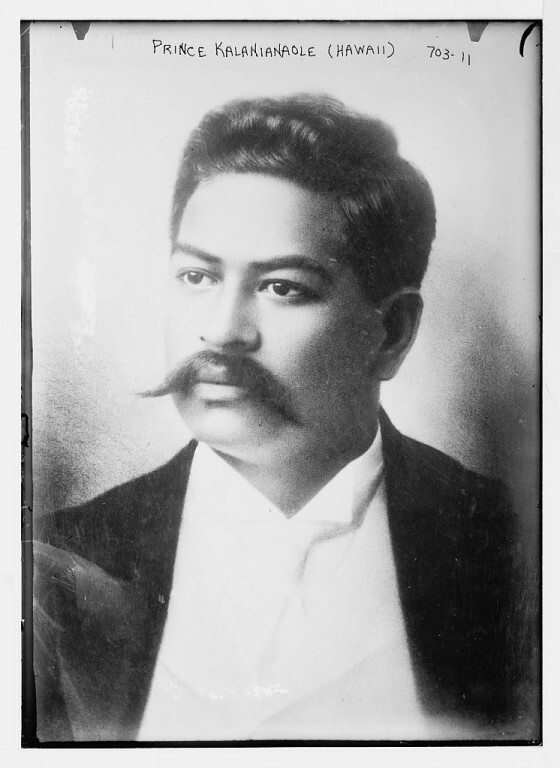 Prince Kuhio became the Republican Congressional Delegate in 1902 at the age of 31. He served for 10 consecutive terms, focusing on what he called, “the rehabilitation of our race,“ and passing the Hawaiian Homes Commission Act, which established about 200,000 acres of permanent homeland for native Hawaiians. He was also known for his athletic prowess in football, rowing, horsemanship, and more. Learn more about Prince Kuhio in the Department of Hawaiian Homeland and Congressional Record’s nice write up here.